If there was ever a game that should've been remembered for it original and unique gameplay concepts, then hands down that game is Zaxxon. 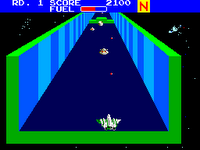 Zaxxon was an arcade space shooter released by Sega in 1982 and became quite popular. The big draw of the game was its isometric view which allowed the player to be immersed in a 3D realm. While other space shooters only allowed the player to move left or right, Zaxxon had a 3D stage setup that allowed you to move the ship in any direction. This free range of movement is what made Zaxxon a hit in the arcades but somehow that got lost when it was ported when it was ported to home computers and consoles. 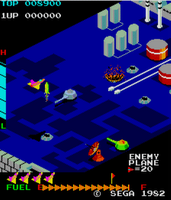 First released for the Atari 2600 and intellivision, Zaxxon lost its isometric viewpoint and became a standard 2D spaceshooter due to the consoles limited hardware. It was then ported to several home computers and consoles that had stronger hardware and allowed Zaxxon to keep its view with only a loss to the games color palette. In 1987, Sega released a version for their home console, The Sega Master System, titled Zaxxon 3D. 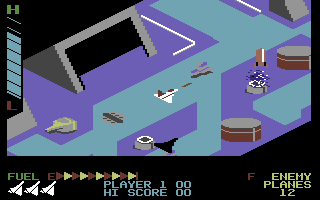 Zaxxon 3D changed the view to a 3rd person, or over the shoulder perspective, and made use of the consoles 3D goggles to enhance the experience. The concept was an interesting twist to the game but sadly wasn't a big hit since the system's fan base was limited. Zaxxon did however produce two sequels, Super Zaxxon and Zaxxon Motherbase 2000. Super Zaxxon was released later 1982 by Sega but did not meet the same success of its predecessor. Super Zaxxon ran on the same hardware as the first gameBesides new level layout and a slightly(and barely noticeable) color palette, Super Zaxxon had nothing new going for it. Zaxxon Motherbase 2000 was released for the illfated and short lived Sega 32X. It was the first game in the series to fully use polygons while keeping its isometric view. Unlike Super Zaxxon, Motherbase 2000 had new gameplay elements. The major element of gameplay revolved around merging your with other ships(which resembled insects) for varying gameplay styles. The smaller ships were very fast and manuverable while the larger ships were slow moving but pack a punched. However, because of the poor sales figures of the 32X and poor reviews of the game, Zaxxon Motherbase 2000 quickly disappeared off the map. Since then, Sega has not even attempted a resurrection of the series, although Zaxxon is one of the games on the recently released Sega Genesis Collection for the PS2. Throughout the years, there were imitators, clones and bootlegs. The first bootleg of the game came out the same year as Zaxxon back in 1982, called Jackson. The TRS-80 personal computer also had a clone called Zaksund. Sammy (who now owns Sega) released a game called Viewpoint which was released for the Neo-Geo. Even though Sega chooses to ignore their forgotten franchise, their fans have chosen to keep it alive. A website called Zaxxon Retro-remake held a contest back in 2003 for indie game developers to make their own Zaxxon game for the PC. So even though Sega has easily forgotten the Zaxxon franchise(like so many others *cough*streets of rage*cough*) it is the community of indie developers and gamers that will keep it alive. Images as they appear in order. just thought I'd let you know a place where you can make some nice extra cash secret shopping. Enjoyed the blog about ps3 preview found it very informative. I found a good website which also features ps3 preview and ps3 preview. The link is great for **uk bargains** including Nintendo Wii, PS2, PS3, games consoles and features famous online stores inc Argos, Marks and Spencer, Empire Direct, LX Direct, Tesco, Next. There is also a chance to play online bingo and try your luck at the online gambling sites available inc roulette, poker and fruit machines. I've also found another site for **free soccer links**. Hope you find these sites interesting - all the best! Enjoyed the blog about console game nintendo virtual wii found it very informative. I found a good website which also features console game nintendo virtual wii and console game nintendo virtual wii. The link is great for **uk bargains** including Nintendo Wii, PS2, PS3, games consoles and features famous online stores inc Argos, Marks and Spencer, Empire Direct, LX Direct, Tesco, Next. There is also a chance to play online bingo and try your luck at the online gambling sites available inc roulette, poker and fruit machines. I've also found another site for **free soccer links**. Hope you find these sites interesting - all the best! Good blog - very interesting!! Thought you might like some excellent advice on driving extra traffic to your website/blog - I'm into adult shop and to drive traffic to my website I was searching around the internet for absolutely ages looking for SEO tools to fire my site up the Google search engine, then I signed up free for this superb traffic gereating tool - I now have loads of hits to my websites/blogs and my site is shooting up the Google rankings quicker than ever before. Good blog - very interesting!! Thought you might like some excellent advice on driving extra traffic to your website/blog - I'm into adobe photo shop 7.0 and to drive traffic to my website I was searching around the internet for absolutely ages looking for SEO tools to fire my site up the Google search engine, then I signed up free for this superb traffic gereating tool - I now have loads of hits to my websites/blogs and my site is shooting up the Google rankings quicker than ever before. Hi, seeing as you accept anonymous blogging I thought I would send you this info about online gambling from a guy at work. His blog features bonus casino and he has made a fortune from online gambling. I hope you don't mind me blogging anonymously like this. I thought the blog was really cool. I am also into free video poker. Good blog and clever to allow anonymous blogging because search engines love more content. I have a blog toronto seo company and I added a whozontop promotional link. Within no time your blog will shoot up the google rankings and you also get the added benefit of keeping a track on your blog/website visitors. Keep up the good work, Rich. Thank you dear admin for hard work for visitors, i visit your exclusive blog very soon. I go to play online poker bonus now. One of the basic principles of ABC poker is, only play good hands! 2 No Bluff! Start free play this is Steve Byron and he looking for poker bankrolls. None of these conditions is not met for low rates: Enemies do not watch and do not think. Players are weak and have even average hands have passed. So even if you can bluff, say, twice for 100 chips, in the hands of a third party to fail and lose 500 It really does work! In addition, any such player is thinking, "Uh-oh, if I play poker online longer at 25/50 that they are already so high stakes that I can not play ABC, because surely lose." It starts combined and actually loses ... and 25/50 is not even average rates! Average rate is 1/2 to 3/6, and there also works best ABC!